This looks so beautiful! I love soft fruits but we just don´t get them in Andalucía – too hot! Thanks – hope you manage to get hold of them at some point. I love that you said “slightly stale.” When I made Summer Pudding, the bread I used was several days old and the whole thing just tasted like wet, stale bread, which is not nice! I wish the recipe I used had added “slightly” to their description! Good point! I think the “slightly stale” point means the bread is a bit easier to cut and it absorbs the juices more easily as it’s a bit drier. But of course the quality of the bread matters – funny-tasting bread means funny-tasting pudding! Your blog is on my favorite list for quite a while now- It´s time to let you know how much I enjoy reading your posts. This pudding looks very delicious, very tempting and absolutely like summer! Hi – thanks so much for your comment. I’m glad that you enjoy reading my blog! 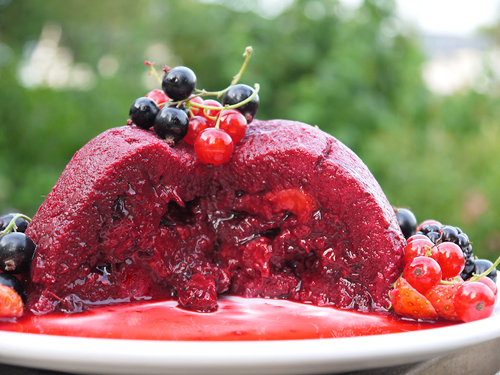 Also glad you like the summer pudding – there was so much fruit, this was just the perfect way to use it. Oh those Scottish rasps. Just looking at them takes me back so many years to when I was a “berry picker”. Hope there are some left at the “family ranch” when I get there in September. The flavour must be sensational. The pud looks divine. Hi there! I thought this might bring back a few misty-eyed memories. I’ll check with “lady of the ranch” but I think there is a plan to keep a few goodies to one side for later in the year. It’s been a long time since I’ve made a summer pudding. Too long. Yours looks gorgeous! I’m sure to be making one soon now. 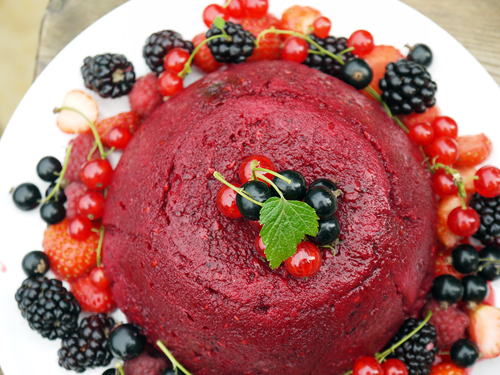 Thanks Jean – this is only my second attempt at making summer pudding, but I was very happy with how it turned out. My mum had made one the previous day for a party, and she left the fruit to macerate in the sugar for five hours before re-heating and assembling the pudding. And I have to say, it did add a little extra something to the flavour. Good luck with the pudding! What fruits will you be using? That looks stunning and very mouth-watering – I don’t think I have seen one look so good! Thanks Lesley! But I think a lot of the credit needs to go to the fruit grower who spent all those chilly mornings in the garden tending to the plants. All that fruit strewn in a rustic fashion around the pud really makes it look special. Is this a Scottish Dish ?? I have to make a dish that they eat in Scotland and I want it to be simple and easy! Is this it ?? 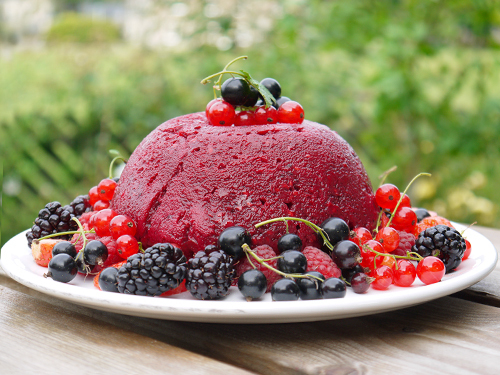 Hi – summer pudding is British, but not specifically Scottish as far as I know. You could make it Scottish by using Scottish fruits – raspberries, brambles (blackberries) and blaeberries (blueberries). Another quick and easy idea – which certainly IS Scottish – is cranachan, made with raspberries, cream, oats and honey. The recipe is here. Otherwise you can make a Scottish fruit dessert called Ecclefechan Butter Tart, which is also nice.